Koova, commonly called as arrowroot is a small shrub grown in India. It is a group of ginger like plants. 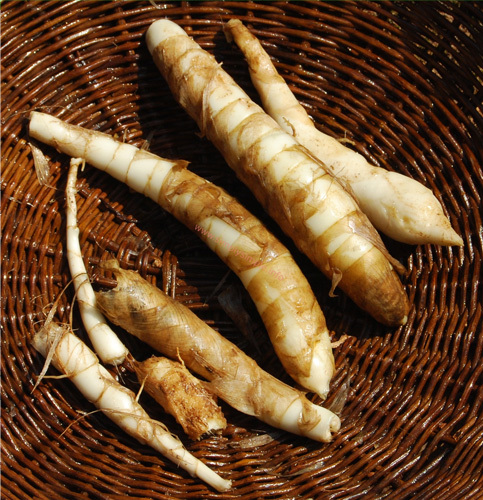 It is a root crop and its rhizome can be boiled and eaten. The underground stem of arrowroot yields flour. It is used as a spice and as food additives. It is used in the preparation of food items such as pudding, bakery products, vegetable and non vegetarian dishes. In dishes it is used mainly for thickening the gravy. The tubers of arrowroot contain starch. The tubers are first cleaned properly to remove the scales and are dried well. They are then beaten to reduce it into pulp form. The pulp thus obtained is passed through a sieve and the starch is allowed to settle. The wet starch is then dried in sunlight to get a powder which is then packed in air tight containers. This is necessary for better preservation. It has various medicinal properties and is used for treating cough, respiratory problems, stomach upsets etc.